With the ever increasing popularity in open plan office and retail environments and in particular high street banking facilities, operators face an ever increasing challenge to maintain privacy and confidentiality. The new layout and design of a number of high street banking branches offer customers and staff a clean-modern environment and the latest innovative technology to enable customers to bank in a way that suits them and in surroundings that are comfortable and accessible for all. Recently implemented in six branches an internal process commenced following the re-opening of these branches to fully evaluate customer reactions to the practical elements of the new design. The new branch layouts have received very positive responses for their aesthetics, with one customer posting on the local newspaper website, “I went in today and was amazed. The branch is phenomenal, the new tills are so much more open and it allows me to be much more chatty and relaxed”. Whilst popular with customers the open plan design presents a number of acoustic challenges, especially in the new consulting rooms that use open acoustic fins in a section of the wall and no door, operated in some branches. 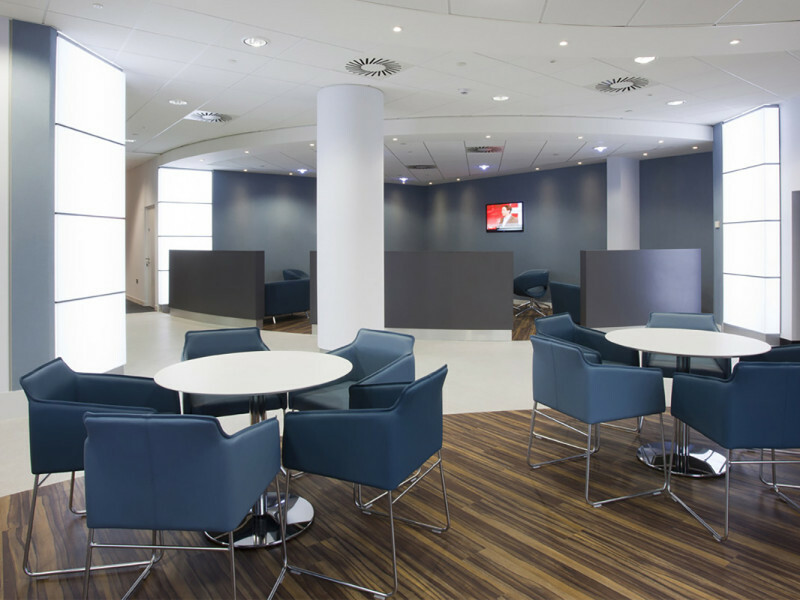 It is business critical banks ensures risks of conversations being overheard are minimised, especially as the new open plan designs appear to encourage customers to “be much more chatty and relaxed”. The acoustic solution to resolve this issue is provided in the form of sound masking – a technology introducing white noise to any given space to increase ambient noise levels to levels above the human voice. In doing so sound masking systems are able to minimise ‘circles of disruption’ from approximately 15m (without sound masking) to approximately 6m (with sound masking). In reducing the effective distance of travel of human voices in conversation, privacy and confidentiality is ultimately improved. Prior to installation, an on-site test of a sound masking system took place at one of the new branches with sound masking emitters placed in consultation rooms and the surrounding areas outside. The result was an increase in privacy for customers in the consultation rooms and a reduction in conversations being overhead outside of the rooms. Stanislas Boivin-Champeaux, managing director for Sound Directions commented, “The sound masking systems used, manufactured by Cambridge Sound Management, adopt a very quantifiable, measurable and zone-able approach to the challenge of sound masking. This allows us to look at each space individually and apply a level of sound masking, introduced gradually over a number of days and weeks, at the correct level for each space”. “We are particularly happy that we have been able to assist in this instance in improving the confidentiality and services offered to the banks customers”. To learn more about Sound Masking and the benefits it can provide – click here!